Astro-Vision's Tamil astrology software is being used successfully by famous Astrologers all over the world for over 25 years. Our Tamil astrology software has found wide acceptance both in India and abroad, with a large client base in Singapore, Malaysia, Sri Lanka, India and Europe. Our Tamil astrology software provides accurate, precise calculations and predictions. This time tested astrology software does the job of calculating the astrological values allowing you to focus on astrological analysis. Astro-Vision's Tamil Astrology software includes complete set of calculations required for astrological analysis and astrology consultancy as per Vedic astrology. If you are looking for a Tamil astrology software which includes calculations as well as predictions in Tamil, then Astro-Vision LifeSign Tamil Astrology Software with predictions is for you. Various ayanamsa settings are provided, such as Chitra Paksham ayanamsham or lahiri ayanamsham,raman ayanamsham, krishnamurthy ayanamsham, tirukanitham ayanamsham and a user defined ayanamsham. These options are especially useful for astrologers and students of astrology interested in Indian astrology research. Includes a large database of cities from around the world. So you don't have to spend time entering the latitude, longitude or time zones. An option to add more cities is also available, thus making it fullycustomisable. A naligai to hour convertor makes it easy for cross reference. Choose from two options available for selecting the method for bhava balam, one being the nature of mercury determined by association, the other being mercury as benefic, irrespective of association. The Tamil Horoscope software is easy to use and simple. The menu options are easily accessible and the calculations reports are organised in an efficient manner. Now Tamil Astrology Software comes with a special offer - get our extremely popular Tamil Panchangam Software StarClock VX absolutely FREE! Some of the features of Tamil Panchangam Software include dual language mode i.e., reports can be made in English as well as Tamil; representation of qualities of the planets, astrological qualities of the moment, exact rahu kalam, gulika kalam, identify transit times and transit positions, muhurtham software and Panchangam Calendar. 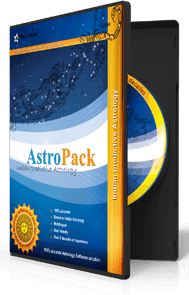 AstroPack Tamil Astrology Software Calculates Birth Star ( piranda nakshatram ) as well as various astrological properties of the nakshatram and horoscope such as nakshatra padam, Birth rasi and the rasi adhipathi, Lagna Ascendant and the Lagna adipathi , Thidhi ( Lunar day ), Dinamana or pagal pozhudhu, Astrological Day of birth, Kalidina Sankhya ( Kalidina En ), Nakshatra adipathi, Ganam, Yoni, Mirugam, Paravai, Tree, Chandra Avastha, Chandra Vela, Chandra Kriya, Dagda Rasi, Karanam, Nithyayogam, Rasi of Sun - Star Position, Position of Angadityan, Yogi Point - Yogi Star, Yogi Planet,Duplicate Yogi, Avayogi Star - Planet, Atma Karaka ( Soul ) - Karakamsam, Amatya Karaka, Lagna Aruda (Pada ) / Thanu and Dhana Aruda ( Pada ). Nirayana longitude of planets, which is the basis of calculations in the Indian system are derived from the Sayana values. All the charts, calculations and analysis provided in the Tamil horoscope software are based on Vedic Astrology. The nirayana longitude of planets, the rasi, the longitude in the rasi, the nakshatram as well as nakshatra padam is calculated. The Nakshatram, nakshatra adipathi, sub lord as well as sub sub lord is calculated for each planet. A brief summary of the nirayana longitude of the planets is also provided along with the rasi chakram and navamsam in the Tamil astrology software.The dasa as well as dasa balance at birth is also provided along with the rasi chakram and navamsam. A special rasi chakra chart is also provided in the Tamil horoscope software, giving details of whether a navamsa or planet is in retrograde motion, or whether it is exalted, debilitated or combust. AstroPack Tamil Jothidam software also provides the bhava kattam ( bhava chart ) and the bhava attavanai (bhava table ) giving details of the thodakkam ( arambha ), Nadu ( madhya ), Mudivu ( anthya )and the list of planets located in bhava. Corresponding to each planet, a sub-planet ( Upagraha ) is calculated in the Tamil horoscope software. The sub planets of Moon, Venus, Mars, Rahu and Ketu are based on the longitude of the Sun and these values are calculated. The dhumadi group of Sub Planets is provided in a table with details of the method of calculation for each of these sub planets. The Upagraha longitudes are also calculated and presented in table format for easy reference. The Nakshatra adipathi / Sub-Lord / Sub-Sub-Lord Charts of Upagrahas are also available. The Upagraga rasi chakram is calculated and the Upagaraha rasi chakram is provided. AstroPack Tamil Horoscope software calculates the values corresponding to the aruda chakra chart and prepares the aruda chakra. AstroPack Tamil Jothidam software calculates the values present in the shodasavargha attavanai and prepares the shodasavargha attavanai. AstroPack Horoscope software in Tamil calculates the Lords of the shodasavarga and presents it in chart format for easy reference. AstroPack Tamil Horoscope software calculates the vargottama. AstroPack Tamil Jothidam software calculates the varga bhedam values wherein points are allocated for Swavarga ( own house ) and Uchavarga ( exaltation ). The varga bhedam table is also prepared. AstroPack Tamil Astrology Software prepare various charts after making the neccesary calculations such as the rasi chakram, Horai, Drekkanam chart, Chathurthamsam chart, Saptamsam chart, Navamsam, Dasamsam chart, Dwadasamsam chart, Shodasamsam chart, Vimsamsam chart, Chathurvimsamsam chart, Bhamsam chart, Trimsamsam chart, Khavedamsam chart, Akshavedamsam chart and Shashtiamsam chart. AstroPack Tamil Astrology Software calculates the values pertaining to various Ashtakavargam Charts and prepares the various Ashtakavargam Charts such as the Chandra Ashtakavargam chart, Surya Ashtakavargam chart, Budha Ashtakavargam chart, Shukra Ashtakavargam chart, Kuja Ashtakavargam chart, Guru Ashtakavargam chart, Sani Ashtakavargam chart and the Sarva Ashtakavargam chart. Various Ashtakavargam charts after reductions are also prepared and presented in the Tamil Jothidam software. A brief summary of Vimshottari Dasa periods is given in the Tamil astrology software . Details of the Dasa and Bhukti ( Apaharam ) periods are given with details of the Thodakkam (arambha ) and Mudivu ( anthya ) for each Bhukti ( Apaharam ) within each Dasa period. AstroPack Tamil Astrology Software presents the details of the Paryanthardasai within each Bhukti ( Apaharam ) including the Thodakkam ( arambha ) and Anthya for each Paryanthardasai. An analysis of the planetary disposition including Lords of Houses, the Bhava lord of each house,Planetary conjunction ( yogam ), Planet to planet aspects, Planet to house aspects, Benefic Planets and Malefic planets and their effects, Friendship Chart , Aspect Strength Chart ( Drikbala ) in Shashtiamsas,Shadbala Table, Bhava Aspect Strength Chart ( Bhava Drikbala ) in Shashtiamsas, Bhava Balam Table,Sevvai dosham ( Kuja Dosha Check ), Moudhyam ( combustion ), Graha Yuddham ( Planetary war ) and Grahavasthai is presented in AstroPack Tamil Astrology Software. The important combinations which result in a yogam are identified in the horoscope and are listed with a brief mention of the effect it can have. While listing the Yogams, the combinations which resulted in the yogam are also given for easy reference in AstroPack Tamil Astrology Software. அஸ்ட்ரோ விஷனின் தமிழ் ஜோதிட மென்பொருள் 25 ஆண்டுகளுக்கும் மேலாக பகழ்பெற்ற ஜோதிடர்களால் உலகம் முழுவதும் வெற்றிகரமாகப் பயன்படுத்தப்பட்டு வருகிறது. இந்தியாவிலும் வெளிநாடுகளிலும் எமது தமிழ் ஜோதிட மென்பொருள் பலராலும் ஏற்றுக் கொள்ளப்பட்டுள்ளது. சிங்கப்பூர், மலேசியா, இலங்கை, இந்தியா மற்றும் ஐரோப்பாவில் இந்த மென்பொருளைப் பயன்படுத்துவோரின் எண்ணிக்கை மிக அதிகம். எமது தமிழ் ஜோதிட மென்பொருள் துல்லியமான, சுறுக்கமான கணக்குகளையும் முன்கணிப்புகளையும் அளிக்கிறது. இப்போது, பரீட்சிக்கப்பட்ட ஜோதிட மென்பொருள் ஜோதிட மதிப்புகள் கணிக்கும் வேலையைச் செய்வதால் நீங்கள் ஜோதிட பகுப்பாய்வுகளில் கவனம் செலுத்த இது உதவுகிறது. ஆஸ்ட்ரோ-விஷனின் தமிழ் ஜோதிட மென்பொருள் ஜோதிட பகுப்பாய்வுகளுக்கும், வேத ஜோதிடத்தின்படியான ஜோதிட ஆலோசனைக்கும் தேவையான முழு கணக்குத் தொகுப்புகளையும் உள்ளடக்கியது. கணக்குகள் மற்றும் முன்கணிப்புகளை தமிழில் தரும் தமிழ் ஜோதிட மென்பொருளை நீங்கள் தேடினால் உங்களுக்காக அஸ்ட்ரோ விஷனின் வாழ்க்கைக் குறியீடுகள் முன்கணிப்புகளுடன் உள்ள தமிழ் ஜோதிட மென்பொருள் உள்ளது. சித்ர பக்ஷம் அயனம்சம் அல்லது லஹிரி அயனம்சம், ராமன் அயனம்சம், கிருஷ்ண மூர்த்தி அயனம்சம், திருக்கணிதம் அயனம்சம் மற்றும் ஒரு பயனாளியால் வரையறுக்கப்பட்ட அயனம்சம் போன்ற பல்வேறு அயனம்ச அமைப்புகள் வழங்கப்பட்டுள்ளன. இந்தத் தெரிவுகள் குறிப்பாக ஜோதிடர்களுக்கும் இந்திய ஜோதிட ஆய்வுகளில் ஆர்வமுள்ளஜோதிட மாணவர்களுக்கும் இது பயனள்ளதாக அமையும். உலகமெங்கும் உள்ள பல்வேறு நகரங்களின் மிகப்பெரிய தரவுத் தளத்தை உள்ளடக்கியது. எனவே, நீங்கள் அட்சரேகை தீர்க்க ரேகை அல்லது கால மண்டலங்களில் நேரத்தைச் செலவிட வேண்டியதில்லை. இதில் மேலும் பல நகரங்களை இணைக்கும் வாய்ப்பும் உள்ளது. இதனால், இது முழுமையான மாற்றி அமைத்துக்கொள்ளத்தக்க ஒன்றாக உள்ளது. தாஸ அமைப்புக்கான இரண்டில் ஒன்றைத் தேர்ந்தெடுங்கள். ஒன்று 365.25 நாட்கள் உள்ளது. மற்றொன்று 360 நாட்கள் உடையது. பாவ பலத்திற்கான முறையைத் தேர்ந்தெடுப்பதற்காக இரண்டில் ஒன்றைத் தெரிவு செய்யுங்கள். ஒன்று, ஒப்புமைப் படுத்துவதால் உறுதிசெய்யப்படும் வெள்ளியின் தன்மை. மற்றொன்று ஒப்புமை இருந்தால் கூட வெள்ளி சாதகமாக உள்ள தன்மை. தமிழ் ஜோதிட மென்பொருள் உபயோகப்படுத்துவதல் எளிமையானது மற்றும் சுலபமானது. பட்டியலில் உள்ள தெரிவுகள் சுலபமாக அணுகக்கூடியது மற்றும் கணக்கீடு அறிக்கைகள் யாவும் ஆற்றல்மிக்க வகையில் ஏற்பாடு செய்யப்பட்டுள்ளது. தமிழ் ஜோதிட மென்போருளில் இதன்மூலம், ஒரு நவாம்சா அல்லது கிரகம் எதிர் திசையில் நகர்கிறதா அல்லது உயர்த்தப்படுகிறதா, வலுகுறைக்கப்பட்டுள்ளதா அல்லது மறைக்கப்பட்டுள்ளதா என்பது பற்றிய விளக்கங்கள் தரும் ஒரு சிறந்த ராசி சக்கர அட்டவணையும் அளிக்கப்படுகிறது. ஆஸ்ட்ரோ பேக் தமிழ் ஜோதிட மென்பொருள், பவ கட்டம்( பவ விளக்கபடம் ) மற்றும் பவ அட்டவணை(பவ அட்டவணை ) ஆகியவற்றை வழங்குகிறது மேலும் விளக்கமாக தொடக்கம்( ஆரம்ப )நடு( மத்திய ),முடிவு ( அந்திய ) மற்றும் பவ கட்டத்தில் ஏராளமான கிரகங்கள் இடம்பெற்றுள்ளது. ஒவ்வொரு கிரஹத்திற்கும் ஏற்ற உப கிரஹத்தை தமிழ் ஜோதிட மென்பொருள் கணித்துத் தருகிறது. சந்திரன், வெள்ளி, செவ்வாய், ராகு மற்றும் கேது ஆகியவற்றின் உப கிரஹங்கள் சூரியனின் தீர்க்கக் கோட்டை அடிப்படையாகக் கொண்டவையாகும். இவற்றின் மதிப்புகளும் இங்கு கணிக்கப்படுகின்றன. துமாடி குழுவைச்சார்ந்த உப கிரஹங்கள் பற்றியும் அந்த ஒவ்வொரு உப கிரஹத்தின் கணிக்கும் முறைகளும் ஒரு அட்டவணையில் கொடுக்கப்பட்டுள்ளன. இந்த உப கிரஹ தீர்க்கக் கோடுகளும் கணிக்கப்பட்டு எளிதாகக் கையாளும் வகையில் அட்டவணை வடிவத்தில் தரப்பட்டுள்ளது. உப கிரஹங்களின் நட்சத்திர அதிபதி / துணைக் கடவுள் / துணையின் துணைக் கடவுள்களின் அட்டவணையும் இங்கு கிடைக்கிறது. உப கிரஹ ராசி சக்கரம் கணிக்கப்பட்டு வழங்கப்பட்டுள்ளது. அஸ்ட்ரோ பேக் தமிழ் ஜோதிட மென்பொருள் ஆருடச் சக்கர அட்டவணைக்கு ஏற்ற மதிப்புகளைக் கணக்கிட்டு ஆருடச் சக்கரத்தைத் தயாரிக்கிறது. அஸ்ட்ரோ பேக் தமிழ் ஜோதிட மென்பொருள் ஷோதசவர்க அட்டவணையில் தரப்பட்டுள்ள மதிப்புகளைக் கணக்கிட்டு ஷோதசவர்க அட்டவணையைத் தயாரிக்கிறது. அஸ்ட்ரோ பேக் தமிழ் ஜோதிட மென்பொருள் ஷோதசவர்காவின் கடவுள்களைக் கணித்து எளிதாகக் கையாளும் விதத்தில் அட்டவணை வடிவத்தில் தருகிறது. ஆஸ்ட்ரோ பேக் தமிழ் ஜோதிட மென்பொருள் வர்கோத்தமாவை கணக்கிடுகிறது. அஸ்ட்ரோ பேக் தமிழ் ஜோதிட மென்பொருள் வர்க பேத மதிப்புகளைக் கணித்து சயவர்கா (சொந்த வீடு) மற்றும் உச்சவர்கா (உயர்த்தப்படுதல்) ஆகியவற்றுக்கான மதிப்புகள் அளிக்கப்படுகின்றன. வர்க பேத அட்டவணையும் தயாரிக்கப்படுகிறது. ஆஸ்ட்ரோ பேக் தமிழ் ஜோதிட மென்பொருளானது முக்கியமான கணக்கீடுகளை உருவாக்கிய பிறகு பலதரப்பட்ட விளக்கப்படங்களை தயாரித்துள்ளது அதாவது ராசி சக்கரம், ஓரை, த்ரிக்கணம் விளக்கப்படம், சதுர்தம்சம் விளக்கப்படம், சப்தம்சம் விளக்கப்படம், நாவம்சம், தசம்சம் விளக்கப்படம்,த்வசம்சம், சோதசம்சம் விளக்கப்படம், விம்சம்சம் விளக்கப்படம், சதுர்விம்சம்சம் விளக்கப்படம், பம்சம் விளக்கப்படம், ட்ரிம்சம்சம் விளக்கப்படம், காவிதம்சம் விளக்கப்படம், அக்ஷவேதம்சம் விளக்கப்படம் மற்றும் ஷாஷ்தியாம்சம் விளக்கப்படம். அஸ்ட்ரோ பேக் தமிழ் ஜோதிட மென்பொருள் பல்வேறு அஷ்டகவர்கம் அட்டவணைகள் சார்ந்த மதிப்புகளைக் கணித்து சந்திர அஷ்டகவர்கம் அட்டவணை, சூர்ய அஷ்டகவர்கம் அட்டவணை, புத்த அஷ்டகவர்கம் அட்டவணை, சுக்ர அஷ்டகவர்கம் அட்டவணை, குஜ அஷ்டகவர்கம் அட்டவணை, குரு அஷ்டகவர்கம் அட்டவணை, சனி அஷ்டகவர்கம் அட்டவணை, சர்வ அஷ்டகவர்கம் அட்டவணை போன்ற பல்வேறு அஷ்டகவர்கம் அட்டவணைகளைத் தயாரிக்கிறது. தமிழ் ஜோதிட மென்பொருளில் பல்வேறு அஷ்டகவர்கம் அட்டவணைகள் சுறுக்கப்பட்டு வழங்கப்பட்டுள்ளது. தசா மற்றும் புக்தி( அபஹராம் ) காலங்கள் அதாவது தொடக்கம்(ஆரம்பம் ) மற்றும் முடிவு ( அந்திய ) ஒவ்வொரு புக்தியிலும் (அபஹராம் ) ஒவ்வொரு தசா காலத்திலும் விளக்கமாக தரப்பட்டுள்ளது. அஸ்ட்ரோ பேக் தமிழ் ஜோதிட மென்பொருள் ஒவ்வொரு புத்திக்குள்ளும் (அபகரம்) உள்ள ஒவ்வொரு பரியந்தர்தசையின் விரிவான விளக்கங்களை தொடக்கம் மற்றும் அந்திய (இறுதி) ஆகியவை உட்பட அளிக்கிறது. கிரகங்களின் அமைப்புகளின் ஆய்வில் வீடுபேறுகளின் இறைவன், ஒவ்வொரு வீடுபேரின் பவ இறைவன், கிரகங்களின் சந்திப்பு( யோகம் ),கிரகத்திருந்து கிரகப் பார்வை, வீட்டிலிருந்து கிரகப் பார்வை, நலம்பயக்கும் கிரகம் மற்றும் தீங்கிழைக்கும் கிரகங்கள், மற்றும் அவற்றின் பாதிப்புகள் தோழமை விளக்கப்படம், சாஷ்தியாம்சஸ்சின் பார்வைபலம் விளக்கப்படம்( த்ரிக்பலா ), சத்பலா அட்டவணை, சாஷ்தியாம்சஸ்சின் பவ பார்வைபலம் விளக்கப்படம்( பவ த்ரிக்பலா ), பவபலம் அட்டவணை, செவ்வாய்தோஷம்( குஜ தோஷ செக் ), மௌத்யம்( குழப்பம் ),க்ரஹ யுத்தம்( கிரகங்களின் யுத்தம் )மற்றும் கிரஹவஸ்த்தை ஆஸ்ட்ரோ பேக் தமிழ் ஜோதிட மென்பொருளில் உள்ளது. யோகத்தைத் தரும் முக்கிய இணைப்புகள் இந்த ஜோதிடத்தில் கண்டறியப்பட்டு அவற்றின் விளைவுகள் பற்றிய சிறு குறிப்போடுகூடிய பட்டியலாக்கப்படுகிறது. யோகங்களைப் பட்டியலிடும்போது, யோகத்தைத் தரும் இணைப்புகள் எளிதாகக் கையாளும்விதத்தில் அஸ்ட்ரோ பேக் தமிழ் ஜோதிட மென்பொருளில் தரப்படுகிறது. This astrology software pack is a combination of horoscope, panchang, horoscope matching and baby name finder software.